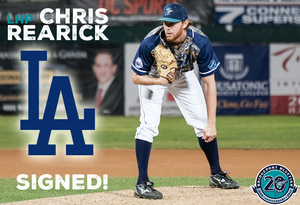 (Bridgeport, Conn., June 18, 2017) – Bridgeport Bluefish team officials have announced that left-handed pitcher Chris Rearick has had his contract purchased by the Los Angeles Dodgers organization. He will report to Double-A Tulsa of the Texas League. Rearick made his Bluefish debut in 2016 after starting the season with the Sugar Land Skeeters. He made seven appearances (six starts) for the ‘Fish and finished the season with a 1.89 ERA and 29 strikeouts in 33.1 innings of work. This season, he has made nine starts for the ‘Fish and owns a 3.02 ERA with four victories and a league-leading 60 strikeouts across 47.2 innings pitched. The 29-year-old began his professional career in 2010 after being selected by the Tampa Bay Rays in the 41st round of the MLB draft. He spent three seasons with the Rays organization, and the following three with the San Diego Padres. Rearick made his Major League debut with the Padres in 2015, making five appearances and striking out four batters in 3.0 innings. Rearick is the second Bluefish player to have his contract purchased during the 2017 season.